After a relaxing week at the campground, I'm staring right at a significant occurrence in my life. 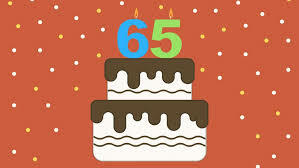 Yep, my 65th birthday is here; I have a Medicare card to prove it if you don't believe me. Turning 65 isn't so bad, really. I'm not yet senile, ancient, a doddering old crone, or ready for the nursing asylum. I have added a few extra pounds but they smooth out wrinkles and might give me a bit of a cushion if I fall down. My bones are occasionally creaky but isn't that what Aleve is for? I am still sassy, curious, and eager to learn new things. There are nice perks to getting old. Senior shopping discounts save me a few bucks. I can eat early and get home in time for the news. Medicare costs less than my previous insurance. If the weather is bad, I can stay in and read. If it's pretty, I can play outside. I can sew all day if I choose to. I don't have to drive at rush hour or care what anybody thinks. I have plenty of time to enjoy my home and the world around me. So what if I'm 65? It's just another milestone. Senior life is good. I've quit saying someday; instead I'm asking what about now? I'm looking forward to many more years of following my own path.